Midwives in Ontario are integrated into the provincial health-care system, providing primary antenatal, intrapartum, and postpartum care to low-risk women throughout pregnancy and for 6-week postpartum. Midwives are educated through a 4-year direct-entry, university-based Bachelor of Health Science program or, if internationally trained, through a 9-month bridging program. During the first year of clinical practice, newly qualified midwives are known as new registrants and are subject to a number of practice restrictions outlined by the College of Midwives of Ontario (CMO). While there is limited research regarding the new registrant year, a qualitative study identified three phases—building, bridging, and being—through which new registrants progress as they transition to clinical practice. There is considerable variation with respect to the experience of new registrants during the transition to clinical practice; however, four elements—preparation, orientation, mentorship, and ongoing education—help new registrants navigate the experience of commencing clinical practice. In order to offer a more standardized approach to supporting Ontario midwives in the first year of clinical practice, it may be beneficial for midwifery stakeholders to look to established transitional models employed in midwifery communities outside of Canada. Association of Ontario Midwives. Association of Ontario midwives. 2015. Available at: http://www.ontariomidwives.ca/midwife/regulation/association. Accessed 25 Oct 2017. Association of Ontario Midwives. Choice of birthplace. 2017a. Available at: http://www.ontariomidwives.ca/midwife/philosophy/birthplace. Accessed 23 Nov 2017. Association of Ontario Midwives. Midwifery Q & A. 2017b. Available at: http://www.ontariomidwives.ca/midwife/q-a. Accessed 23 Nov 2017. Canadian Association of Midwives. Midwifery education in Canada. 2015. 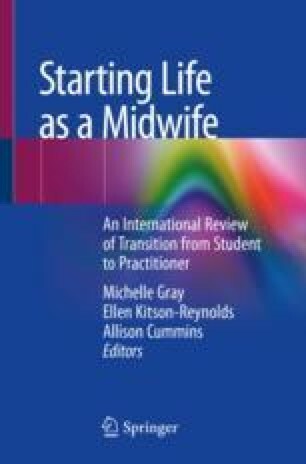 Available at: http://www.canadianmidwives.org/midwifery-education.html. Canadian Association of Midwives. Midwifery education in Canada. 2017a. Available at: https://canadianmidwives.org/education/#1465250089874-d93eb1f9-32f0. Canadian Association of Midwives. Midwifery across Canada. 2017b. Available at: https://canadianmidwives.org/midwifery-across-canada/. Accessed 25 Oct 2017. Ontario Regulation 168/11. Midwifery Act, 1991. 1991. Available at: https://www.ontario.ca/laws/regulation/110168. Accessed 10 Jan 2018. The G. Raymond Chang School of Continuing Education. International midwifery pre-registration program (IMPP). 2014. Available at: http://ce-online.ryerson.ca/ce/default.aspx?id=2161. University of British Columbia. Internationally educated midwifery bridging program. 2015. Available at: https://iembp.midwifery.ubc.ca. Accessed 28 Apr 2015.